Dark-eyed Junco is ready for his close-up. I put out some fresh suet dough and this guy was nibbling away for four or five minutes. 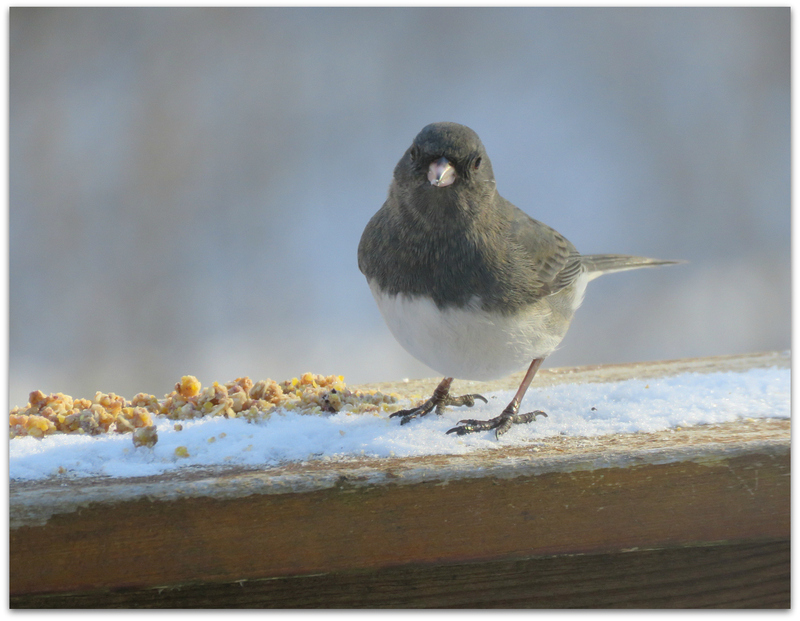 I thought juncos liked seeds, especially millet. This dough was made of lard, peanut butter, oats, flour, cornmeal and chick starter (recipe on sidebar), plus some blueberries. 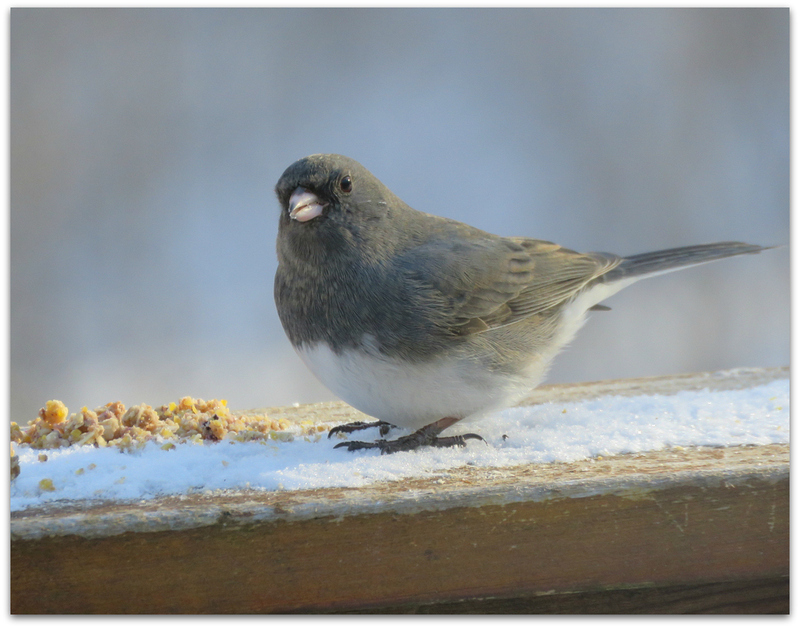 I am happy to get decent photos of a junco. They hop around a lot and like the ground, even the snow-covered ground, better than the porch railing (and much better than perching on feeders). But the railing was where the food was mid-afternoon. When foraging, Dark-eyed Juncos typically hop (rather than walk) on the ground, pecking or scratching at the leaf litter, or flit very low in underbrush gleaning food from twigs and leaves. They sometimes fly up from the ground to catch insects from tree trunks. In flight, they flap continuously and pump their tails so the white outer tail feathers flash; flight is very agile as the bird maneuvers through its tangled environs. Smile, you’re on birdie cam! Another storm coming tomorrow night. Winter has been ridiculous this year. Well, not the whole winter but specifically the month of February! 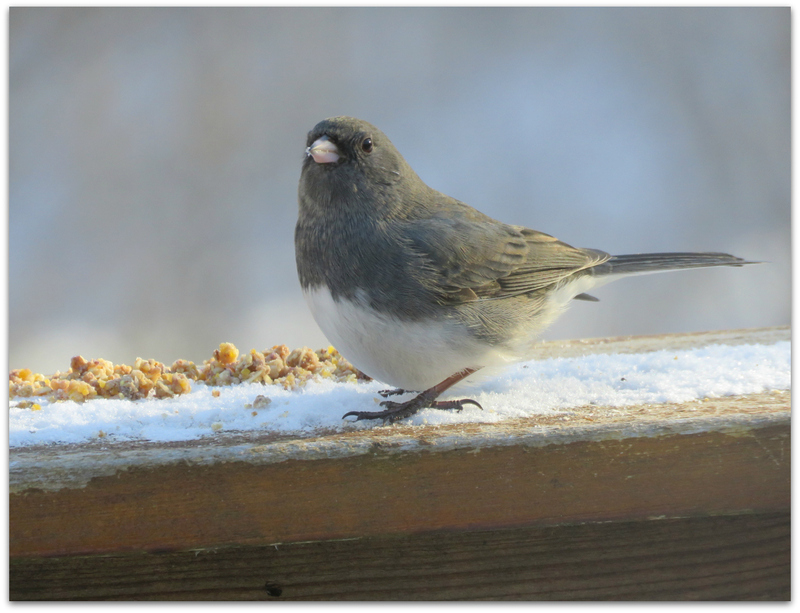 This entry was posted in Uncategorized and tagged Dark-eyed Junco on February 13, 2015 by Amy. Juncos are such cute little birds, and you’re so right about how much they hop around. You really have to keep the camera focused on them to snap a picture when they come to a stop for a second or two! I haven’t seen any around our place for a week or so now. I don’t know if they’ve found greener pastures or if they’re just not around when I look! Very nice photo. Thanks! Same for chickadees moving so quickly.